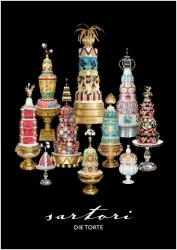 Petra Bacher’s high-design cake portfolio from her Vienna studio, Sartori die Torte, was recently awarded a Silver Medal in the New York-based, international Galaxy Awards competition from a field of more than 800 other marketing projects from 18 countries, the first time, ever, a portfolio of cake designs has achieved this honor. New York, NY, February 11, 2014 --(PR.com)-- Designer Ms. Petra Bacher’s portfolio of cakes featuring high-design, large scale cakes from her Vienna-based Sartori die Torte studio received the 2013 Silver Galaxy Award from MerComm, Inc. (New York), which administers the widely recognized Galaxy international marketing communications and design competition. Ms. Bacher was praised “for her most unusual offering” by Ms. Reni Witt, CEO of MerComm, who said, “This is the first time in the 24 year history of the Galaxy Awards that a portfolio of cakes has been submitted. The judges, who represent top marketing and communications specialists from around the world, praised the highly imaginative approach” of Ms. Bacher’s work. Petra Bacher's Sartori die Torte designs draw upon centuries of design elements from the Austrian Hapsburg Dynasty through successive periods of Baroque, Classic, Jugendstil, Art Nouveau, Art Deco, RingStrasse-era, Weiner Werkstätte and Biedermeier eras to modern and post-modern design elements -- all expressed as highly decorated, large scale cakes commissioned as iconic marketing promotions, banquet centerpieces, desserts, and special event pastry showpieces. Looking closely at Ms. Bacher’s creative and imaginative designs, an observer can see hand crafted towers and flowers, and edible details such as capitals, cornices, florets, medallions, mouldings, pilasters and rosettes informed by the work of painters, jewelers, architects, sculptors as well as interior and garden designers, who have earned Austria’s esteemed, centuries-old design pedigree and reputation. A native of Vienna, Austria, Ms. Bacher holds the Austrian Magister of Art (Master of Fine Arts) degree and has worked as a logo designer, package designer, textile designer, garden designer and interior designer, and Asst. Professor of Textile Design at Vienna’s University of the Applied Arts [Universität für angewandte Kunst-Wien].